Who remembers Hungry Hippo??? Well, here you go. Hippo Chow Down is the life size version of the popular game. 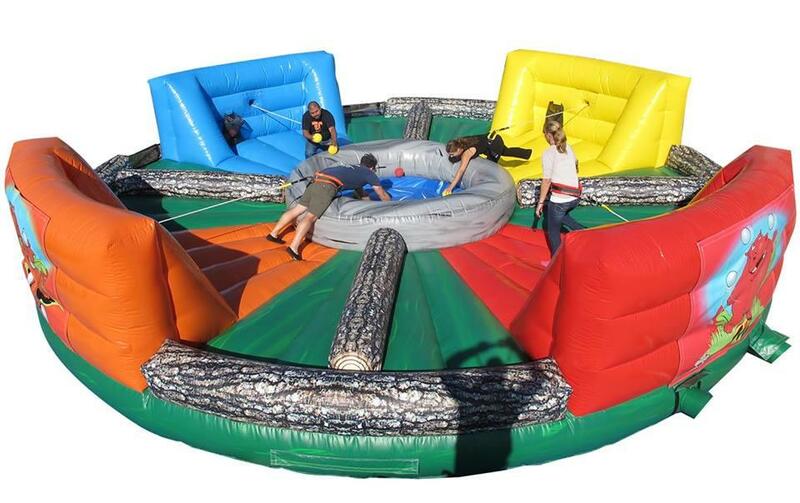 This is Guaranteed fun & hysterics from A Bounceable Time. This 4 player game challenges the opponents to make their way to the center to grab as much "chow" as they can and return it to their feed bag - sounds easy?? Lets not forget that they are tethered to a bungee!! Player with the most "Chow in their feed bag wins!! Fun for ages 6 and up. Open sides for spectators to enjoy as well. Unit is 30' diameter.